Gray grew up in Swansea, before studying for a Degree in Drama at Aberystwyth. After beginning a Marketing career in retail product buying, he studied for a postgraduate in Arts Management at Royal Welsh College of Music and Drama. Prior to joining Insole Court, Gray was Digital Communications and Technology Manager at Chapter Arts Centre, Cardiff. 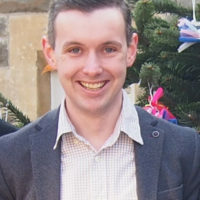 Gray was previously the Marketing & Business Development Manager at Insole Court, responsible for communications and engaging with our visitors. In his new role as Director, he will continue to help Insole Court progress and is committed to Insole Court becoming a leading cultural, heritage and community destination.